We are proud to announce the release of GBAT 1.13! We want you, gamebook author, to have the best gamebook authoring experience available. So we have implemented a new preview window. This should give you a better indication of how your gamebook is going to look when you export it. Please tell us how you like this feature! Right now this is just a read-only view. If it is well received we will make it the primary way of editing your gamebook. I know a lot of you have been asking for this. We can’t fully support CoG format until we have variables, inventories and stats in GBAT. 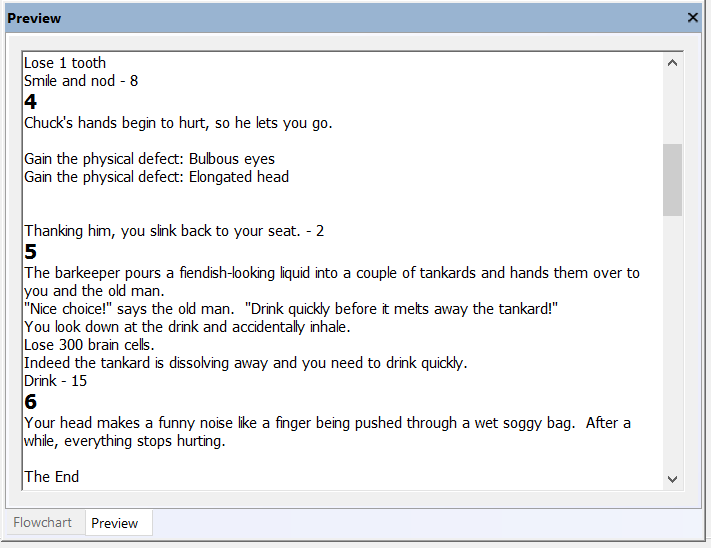 That is some way off, however we can build a gamebook skeleton with your sections and choices. You can now export to a playable CoG format. "Ah ah! Come, warm thy bones!" gasps the bony old man with the ridiculous beard, tugging at your arm and pulling you to the fire, which blazes despite it being really warm outside. "I want to talk about Crumbly Head Games!" he says. "But first, a drink! BARKEEP!" #Order a "Pitcher of Acid"
Thanks for all of your bug reports. They are very important to make this product better. All known crashes are now fixed. Please enjoy! We will now take a short break to play the rest of the Windhammer series, and then return to development. There are some exciting new features in store for 1.14! Download The GameBook Authoring Tool 1.13!